Included in [Emanation] is a masterful cover of Dizzy Gillespie’s “Con Alma” displaying flawless technique and a decidedly inventive style. Emanation brings touches of Bud Powell and Art Tatum to a combination of originals and otherwise… Whether she is re-harmonizing standards or filling an original with dreamy ambient emotional developments, this recital will hold your attention. A recording full of warmth and personal soul and quirkiness. …[T]here are those like Piket—a pianist’s pianist—that seem to always remain fresh, rewiring their brain patterns and hands with each and every solo number they perform. …a woefully underappreciated figure in jazz. Emanation, the latest piece of evidence to make the case for her artistry, is a memorable date that earns high marks in every category, from the creative to the technical to the emotional. Solo captures her allusive wit and expansive imagination as she investigates classic compositions by Monk, Strayhorn, Sam Rivers, Chick Corea, and Wayne Shorter. [Solo] is her first solo project. Her strengths carry over: emotional honesty, harmonic ingenuity, taste and discipline. With Solo [Piket] cements a reputation as a top level jazz artist…. Solo features Piket alone with the piano, the most challenging of formats. To say she has risen to the challenge is an understatement. SOLO begins sweetly and tenderly and ends the same way — with vigorous questioning and exploring of various kinds in the middle. Roberta is an eloquent creator who takes chances but is true to her internal compass, whichever way it might point for a particular performance. [On Enmanation] Piket does not waste her time or that of the listener by creating an album where she merely displays her formidable technique. Nor are there long tortuous passages; in their stead are well-defined melodies, intelligent harmonies and solos that build upon those harmonies and melodies in logical fashion. This is music that breathes, that reaches out for the heart and soul of the listener and, on occasion, for the dancing feet. “Emanation” …deserves your close attention. The rich thoughtfulness that characterizes Roberta Piket’s inventive improvising is immediately apparent on the first track of Solo… The result is an intriguing overview of a jazz pianist who still hasn’t quite received the ovations that her unique talents deserve. [Solo] displays a mastery that is frequently striking and always engaging. It’s hard to believe this is Piket’s maiden voyage on solo piano…. Her playing reflects various influences but it’s her own stunning and singular voice that makes this album so memorable. 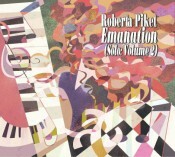 On Emanation, Roberta Piket makes it clear that she knows who she is and what she has to offer…She seeks an unusual and especially rewarding path… casting light into the music from fresh perspectives. Much more can be said about the intricacy of Piket’s complex funk allusions on Herbie Hancock’s “Actual Proof,” or her elastic and inventive treatment of the written left-hand part in her “Fantasy On A Theme By Chopin (Prelude Opus 28, No. 2),” over which she crafts gently dissonant passages in the fashion of Erik Satie’s Gymnopédies. For now, it’s enough to remark on how rare it is to find a pianist whose self-imposed limitations on dynamics and exhibitionism only empower her eloquence. Listen to her deeply moving “Haunted Heart” and you’ll be swept away in shear sensitivity of her playing. Spending fifty minutes listening to an emerging talent’s solo piano voice on Emanation is time well spent.